I found Jose Mourinho almost exactly as English football had left him. A day before his Inter Milan team's potentially Serie A-defining 2-1 win over city rivals AC in the San Siro last weekend, Mourinho threatened to call an abrupt end to his pre-match news conference. The question - the first one of the session - that had so riled him? It concerned the fitness of right-back Maicon, the assembled media wanting to know whether the influential Brazilian would be fit to start in the Derby della Madonnina. "Do you just want me to tell you my team, my substitutes and my tactics and then we can all go home?" 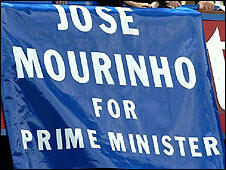 demanded Mourinho. 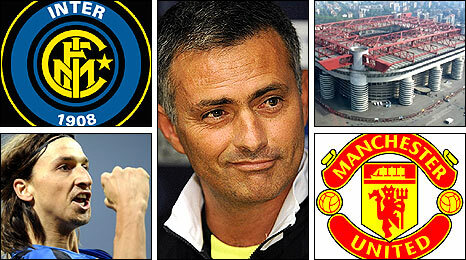 I like Mourinho's praise of us - but does this mean that Inter will rarely attack us on Tuesday? Two minutes later, after repeatedly asking the same question and receiving answers solely in the affirmative, with the atmosphere dramatically tense, Mourinho made to get up and walk out, before a lone voice cut short the madness by telling the Portuguese coach he did not want to hear the team. Mourinho, who resumes his love affair with the English game when his Inter side host Manchester United in their Champions League last 16, first-leg tie on Tuesday, has enjoyed a typically confrontational, not to mention successful start to his tenure at Internazionale. Out of the game for nine months after his shock exit at Chelsea, the 45-year-old made an extraordinary return to football when he was unveiled as the Nerazzuri's new manager in June. At his very first news conference he spoke in fluent Italian, claiming he had learned the language in three weeks of private tuition. And, as if his new public were not already swooning, he was soon dropping in words like "pirla", a colloquialism for "fool" which the Milanese would have to explain to their out-of-town Italian colleagues. Italian historian John Foot, who wrote the book 'Calcio: A History of Italian Football', says Mourinho has captivated the country since that first day. "I think Mourinho was a big thing for Italy," Foot told BBC Sport. "He's a star, a world star, and him coming to Serie A, he's the biggest star to have come for a long time. "There was huge interest in Mourinho from the start. If you remember when he first arrived at Chelsea, it was like that. "He is a genius at getting the press interested in him. He was the story and he remains the story, people continue to be hooked on his every word." On the pitch, Chelsea fans will not be surprised to learn that Mourinho has enjoyed a winning start to his reign at the Stadio Giuseppe Meazza since taking over from Roberto Mancini, who was fired at the end of last season. Mourinho's success must be tempered by the fact that Mancini led Inter to the title in his last three campaigns, but paid the price for a lack of success in European competition. Victory over Milan in the derby helped Inter go nine points clear at the top of Serie A, they are in the last 16 of the Champions League, the semi-finals of the Coppa Italia and have already won the Supercoppa Italiana, Italy's version of the Community Shield. Watching Inter play, it feels like Mourinho is trying to create a clone of the side he so brilliantly crafted during his three-and-a-half-year spell in England. With keeper Julio Cesar protected by a solid back four and hard-working midfield, Zlatan Ibrahimovic and Adriano provide a battering ram effect up front as Didier Drogba did for Chelsea so impressively under Mourinho. 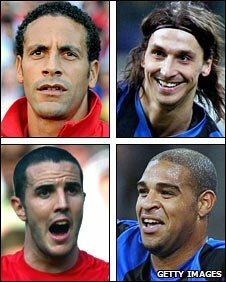 They were second best to Milan for lengthy periods in each half, but simply doubled their work-rate and refused to buckle as Ronaldinho, Clarence Seedorf and Alexandre Pato threw everything they had at them. Manchester United's defence has been lauded for much of this season, but Inter have conceded a paltry 18 goals in 25 league games, another classic trait of any Mourinho team. In-form Swedish striker Ibrahimovic, who has never scored in the knockout stages of the Champions League, told BBC Sport how Inter's new coach has made them even tougher to beat this season. "I think we were good when he arrived, but he is teaching us something new and we are becoming stronger and better," said Ibrahimovic. "He has changed the mentality a little bit. We are hungrier for the big games, which is important. We train differently too, I know every coach trains differently, but every day we are enjoying training. It is fantastic. "Mr Mourinho has spoken about managing other teams, but he has a contract here and I think he will respect it. I think he will stay at Inter for a long time." If he does, Mourinho is sure to upset an awful lot more people before he abandons Serie A for another "project", as he likes to term the team he is coaching. In his eight months in Italy, Mourinho has fallen out several times with journalists, been involved in a slanging match with his Chelsea predecessor Claudio Ranieri, now Juventus boss, and had a spat with new Bologna coach Sinisa Mihajlovic as well. Mourinho's behaviour riled Catania director of football Pietro Lo Monaco so much that he claimed the Inter coach "deserves a smack in the mouth". Foot says Mourinho has polarised opinion in Italy, just as he did while he was in England. However, he warned that unless Inter continue to be successful, Mourinho's outspoken approach could do him more harm than good. "He's certainly divided Italians," said Foot. "His argumentative nature, his polemical nature, his arguments with journalists; they've turned a lot of people against him already. "I think he's gone too far, but I think he did that in England. He personalises things, he did it with (Arsenal boss) Arsene Wenger and he's certainly done it with Ranieri, quite insulting actually, about his age and other things. "The public are absolutely obsessed by him; whether they like him or not is another matter. "As long as he's winning, he'll get away with it. But if they lose to Manchester United and don't win the league, things will be very different. "Even in Italy, everything depends on what happens on the pitch." Mourinho doesn't care who likes him. Asked about his relationship with supporters in Italy compared to his time in England, he said there is not much difference. "Some fans love me, some fans hate me and some never think about me. It's basically the same everywhere. It doesn't change a lot," said Mourinho. Few managers have put themselves under as much pressure to win trophies as Mourinho. Then again, few have been so adept at handling that pressure and Mourinho, perhaps also taking a pot-shot at Wenger and Liverpool boss Rafa Benitez, says he needs to burden himself in order to be successful. "Look at the situation at Chelsea at the moment," said Mourinho. "They have not won anything for one-and-a-half years, while Arsenal have gone five years. Yet it looks like everything is good at Arsenal, while at Chelsea everything is in bits. "Some managers use arriving at a new club as an excuse. They say they need time, and if you do that, you are protected. If you don't win the title in the first or second season, you can keep telling everyone you need time. "Sometimes you stay for four or five years, keep not winning, and then keep demanding more time. "I could never be like this. I live for the risk. I believe you can do it in the first season and if you do not, you fail. I prefer it like this. I prefer the pressure because that's how I live." Pressure does not get much bigger than a Champions League knockout tie against a Manchester United team that is in arguably the best form of Sir Alex Ferguson's 22-year reign. But Mourinho is one of few managers to have outfoxed Ferguson time and again, suffering only one defeat at the hands of the wily Scot in 10 games while he was Chelsea boss. And five years on from leading his FC Porto side to a sensational victory over United in Europe, only a "pirla" would bet against Mourinho repeating the trick this time around.